The drill press has become one of the must-have woodworking tools. Some accessories/attachments if attached to a drill press may enable it to perform a wide variety of woodworking tasks. Apart from cutting wood, drilling the wood is what a woodworker typically does. The drilled holes form the basis of attaching the woods for different functionality and design to create a marvelous piece of furniture. This guide will help you understand the drill press uses in woodworking and how the effective use of drill press can be made in creating a beautiful piece of furniture. So You Are a Woodworker? Why Do You Need a Drill Press? No hand rule can drill holes with an accuracy drill press is the tool that can create neatest holds with the highest precision and accuracy. All you have to do is set the workpiece on the clamp at a perfect angle and inclination and let the drill machine do its work. As compared to the hand drill which needs to be operated manually, which is very time consuming, the drill press can be used to drill any number of holes on any surface in a lesser period of time. Unlike a hand drill, a drill press has greater speed and accuracy. So the worries about the accident or cuts in wood are totally negated while using a drill press. The drill press has inbuilt motors which reduce the efforts of a woodworker and the results are evidence of higher level in terms of consistency and efficiency. Certain workpieces may be curved or rough. The drill press offers a better angle as it has flexibility in adapting to any angle and the inclination can be customized as per the need of woodworker. To understand about creating mortises by a drill press, first, we need to understand what about what are Mortises? They are a hole in a piece of wood. The tenant from another piece of wood fits into the mortise with the help of glue and forms the strongest bond known as a mortise-tenon joint. Apply the glue generously on the mortise with the help of brush and secure the tenon on it perfectly. This is how the drill press is used to create mortises. To use the drill press as a spindle sander, all you need is a sanding drum and a plate that can lift the working surface of the bottom of the drum. So let’s see the steps involved in turning your drill press into a spindle sander. The great of desired size should be placed on the drum and spindle should be tightened. The shank present on the sanding drum is to be placed on the drill’s chuck on should be tightened securely. Raise the table of the drill press to a level where it is just below the spindle. Turn the motor on and your drill press is converted into a spindle sander. The speed range is usually in between 1000 to 2000 RPM depending upon the purpose. Doweling is a process used by woodworkers for centuries. The mechanism involved in doweling is quite simple. Dowels are nothing but small, round wooden sticks, that when inserted in the perfectly matched holes of a corresponding board, adhered with the help of glue, form a strong bond. The process entirely depends on creating perfect joints using high-quality jigs so that the dowels get aligned properly and fit in them. This task can be easily performed in a drill press. Mark the wood piece with the outlines of the desired shape of a mortise with a pencil. Insert the drill bit according to the width of the mortise, close to the drill chuck. Set the depth of the desired size on the drill press that corresponds to the size of the mortise which is present beneath the drill bit. Turn on the drill press and plunge the drill bit into the wood to cut the mortise. Read the drill bit out from the wood and slide it into the board to the width of the drill bit till the working wood is removed to hollow the mortise. The versatility of the drill press helps in using it for various operations involved in woodworking like cutting and creating mortises, spindle sanding, and doweling, thus proving it to be extremely beneficial and effective for the woodworkers. What Size Drill Press Is Required for Woodworking? The range and versatility of the drill press make it indispensable tools for every woodworker. 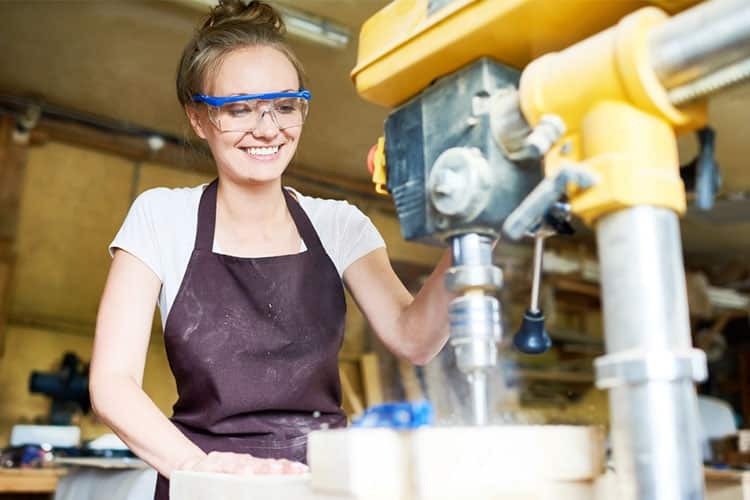 Be it countersinking some holes, creating or cutting of mortises, doweling, cutting a big batch of wood blocks, drill press makes it all easy for you. This tool is a must-have for every woodworker. But the question is what size drill press is apt for woodworking? The capacity of the size of the drill press required for woodworking is based on the distance between the center of the chuck and the front of the column. The distance between these two components is expressed in terms of diameter. The drill press should be wide enough to hold the wood on the plank that you want to work upon or rather in which you should be drilling holes. The area that is covered between the drill bit which is attached to the spindle and the post present on the drill press, which is holding the head decides the death of the throat. The wider the throat depth, the maximum the wood size it can cover. Therefore, the larger chunk of wood can be used if the throat depth is more. Understanding measurements and size of a drill press requires one to understand the swing of the machine, which is double the throat distance. For example, a drill press of 16 inches will have a throat depth of 8 inches. The drill presses usually fall in the range from 10 to 18 inches. For a woodworking workshop, the bigger the size of the drill press, the better the quality and also it can accommodate larger pieces of wood. so that’s highly recommended for the woodworkers. As discussed in the above section of this article, the swing is the measuring indices for the size of the drill press. If you have a drill press of 10-inch size, it can drill the center of the wood piece which is 20 inches wide. It is easier to drill a small wood piece with a larger drill press but when a large object needs to be drilled by a small drill press it becomes really very difficult. The stores will try to sell the drill press depending upon the swing size and the swinging motion. They even go far to the extent saying that a 12-inch drill press will drill a hole only for 6-inch depth. This is absolutely not the case because drill presses have flexibility and can reach out far than mentioned in the marketing comparison. So before considering the size of the drill press when you decide to buy one, keep in mind about the swinging motion and the swing size of the drill press. So depending upon your usage and functions, you can decide on to the size of the drill press that you are thinking for buying for your woodworking workshop. A drill press cannot be limited just for the use of drilling. Its usability goes way beyond that. Cutting mortises, creating mortises, reaming and doweling are the examples of the operations where the drill press can be made use of in the woodworking. The swing size is the parameter that decides what size of the drill press to buy for woodworking. Hope this drill press guide will give you an insight on various drill press uses in woodworking. 7 How to Use a Scroll Saw for Some Intricate Woodworking Tasks? 9 How Does a Wood Jointer Work? Learn the Mechanism Behind It!